The OASE Aquamax ECO Pro 6000 is a solids-handling pump suitable for supplying water to pond filter systems, waterfalls and streams. Ultra efficient OASE motor technology, consuming only 60 watts. Flow Rate of 6000 Litres per hour. Maximum Vertical Lift of 3.6 metres. Can handle and pass up to 10mm diameter solid waste. Adjustable Secondary Inlet can be used to connect an optional Satellite Strainer or Pond Surface Skimmer. 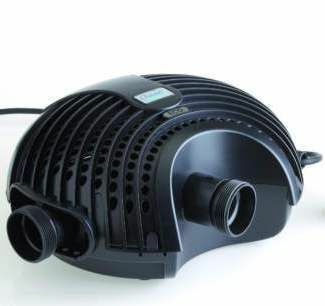 Can be used submersed or dry mounted (flooded suction). Supplied with 10 metres of 230v Cable. Can also be connected to the OASE FM Master 3 Remote Controller, allowing flow control of the pump (ideal for adjusting water flow to streams and cascades). 5 Year OASE Guarantee for added peace of mind. Note: During 2012-13 Oase are discontinuing the Aquamax Eco Pro range of pumps, which have now been replaced with the new Aquamax Eco Premium pump range. See chart below or telephone 02392 373735 or email to check current stock availability. Alternatively, the Aquamax Eco Classic pump range offer a cost effective alternative for the Aquamax Eco PRO 4000, 6000 and 8000 models. To view and compare alternative pump selections see bottom three rows in the chart below. Pump Performance Curves for the OASE Aquamax Eco pump range (4000 - 16000 Litres/Hour). Aquamax ECO pump performance curves.